MATRIC occupies approximately 35 laboratories in Building 740, a five-story office and laboratory building at the West Virginia Regional Technology Park. These laboratories support the wide range of experimental and development activities pursued in the area of chemical process technology. Work areas in these labs are well-ventilated, having chemical hoods for conducting experiments with potentially hazardous materials. Many have been recently renovated with large floor-to-ceiling hoods. Several laboratories are equipped with analytical instrumentation to support ongoing projects. The primary instruments in this lab are gas chromatographs (GC), high-performance liquid chromatographs (HPLC), infrared spectrometers (FTIR), a GC-mass spectrometer (GC/MS), and a UV/Vis spectrometer. These instruments are operated and results obtained through interfaces with laboratory computers. 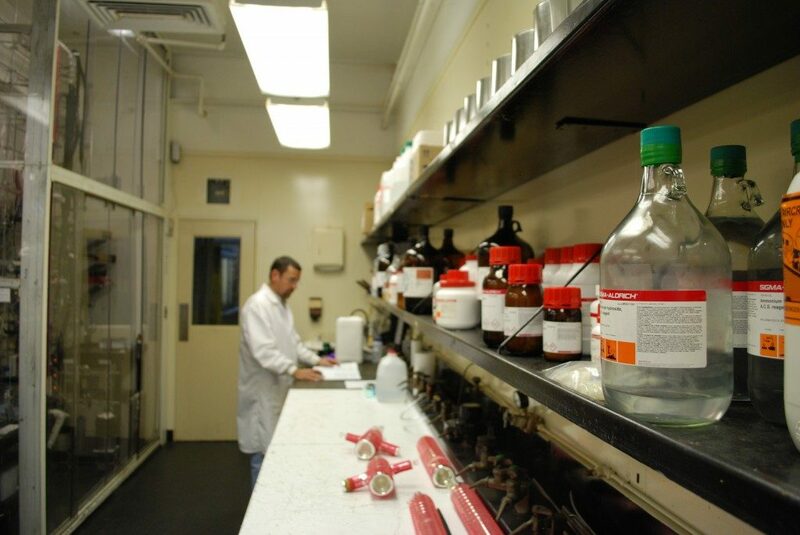 Other laboratories are outfitted for processing inorganic materials, testing advanced membrane separations techniques, organic process research and development, and polymer development. Equipment includes a variety of ovens, furnaces, pumps, an extensive collection of glassware, process control devices, distillation columns, vacuum pumps, pH meters, Karl-Fisher apparatus, and titrators. Other specialized equipment includes a high-intensity mixer, a platen press, high-magnification light microscopes, and an electrospinning device. Also in these labs are installed a number of small high-pressure autoclaves for reactions at elevated temperatures and pressures, which are being used to investigate a variety of chemical processes. This equipment includes stirred autoclaves sized from 300 mL to 2 gallon, equipped with stirring turbines. A six-foot tubular reactor is in place for heterogeneous catalysis studies, such as hydrogenation. Equipment is on hand to construct various sized fixed-bed tubular reactors, and MATRIC staff has extensive experience with the design and operation of these reactors. Separations engineering R&D is performed in several laboratories. A wide array of distillation equipment is on hand and being used in several projects. Other equipment used in this work includes centrifuges, crystallizers, temperature controllers, drying ovens, and moisture analyzers. MATRIC’s facilities also include a scientific glass-blowing operation and a biomass pyrolysis unit. These laboratory facilities have allowed MATRIC scientists and engineers to make remarkable technical progress in projects for many clients. As project needs have developed, it has been possible to acquire, install and operate the equipment to achieve the project goals. MATRIC laboratories support research in areas such as polymer chemistry, separations technology, process development and scale-up, product formulation, biomass conversion and alternative fuels.